Read about the Every Day Heroes who have chosen to be champions for children through their words and action in our spring issue of ‘Nurture’. Our hero staff who worked through the holidays to help relocate our Cincinnati office location. The hundreds of heroes who attended our Blue Ribbon Ceremony and promote April as Child Abuse Prevention Month through education and awareness efforts. 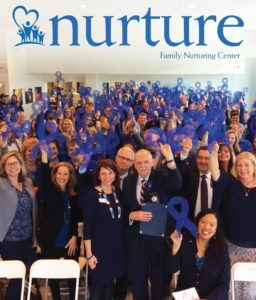 Our hero volunteers who are working on the Blue Ribbon Bash scheduled for August 24th, and our hero friends who raised funds to support Family Nurturing Center’s mission to end the cycle of child abuse. We invite you to read about these heroes and learn how you too can be a hero for children. Thank you!